Another TAVES already? The year since the last Toronto show sure flew by. This year, the show moved uptown – way up to the suburbs, in the Highway 7 Corridor that joins Markham with Richmond Hill. This was historically considered “outside city limits”, but with the megalopolis sprawl we’ve come to know as “the GTA” extending up to Newmarket and Barrie for many folks, Hwy 7 is pretty much right in the heart of things now. 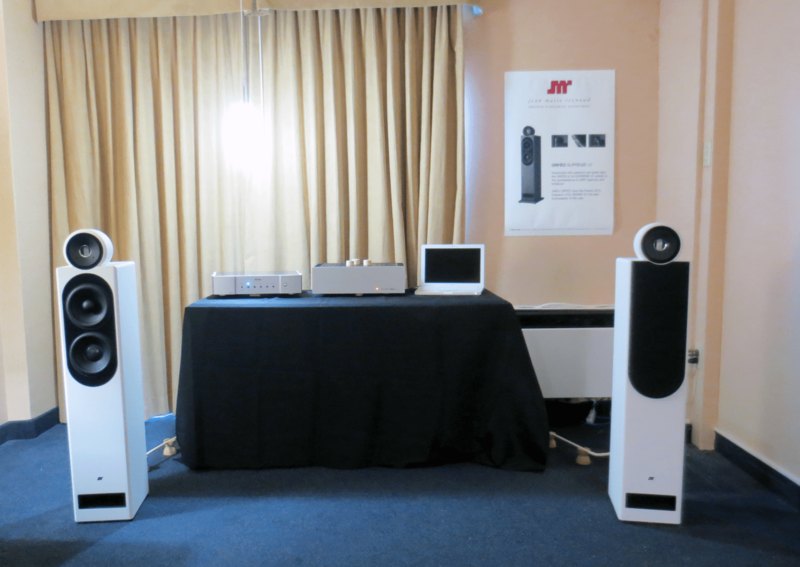 While TAVES is increasingly billed as a “consumer electronics show”, showcasing robotics, gaming and automotive tech, it’s really still an audio show at its core. 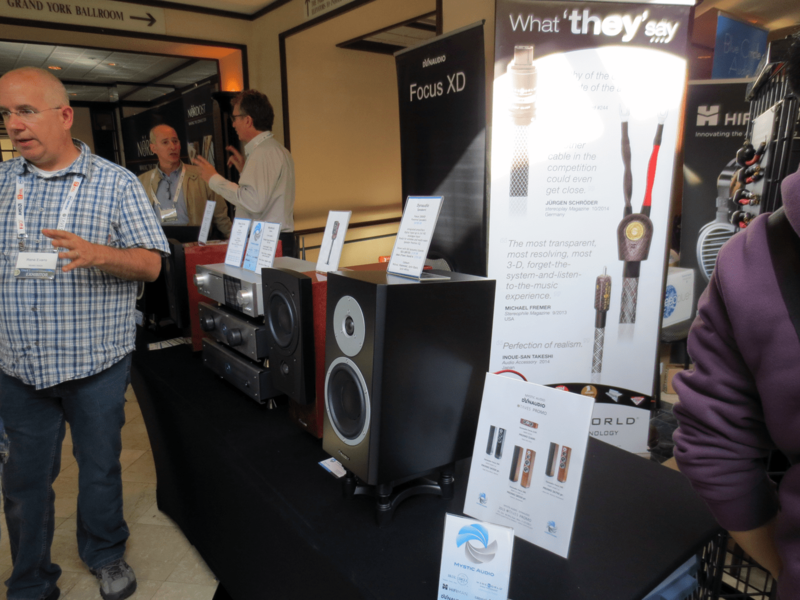 The layout this year was certainly different: the larger rooms, table displays and “new tech” were in the Sheraton Parkway, while the vast majority of the audio exhibits were in the adjoining Best Western. This meant a little more searching (and walking) than some may have liked, but overall it was a pretty decent setup. I spent most of my time in the Best Western rooms, checking out what was on tap sonically, and catching up with people I don’t see all that often. This year was a mix of the new and the familiar, and I enjoyed the day. 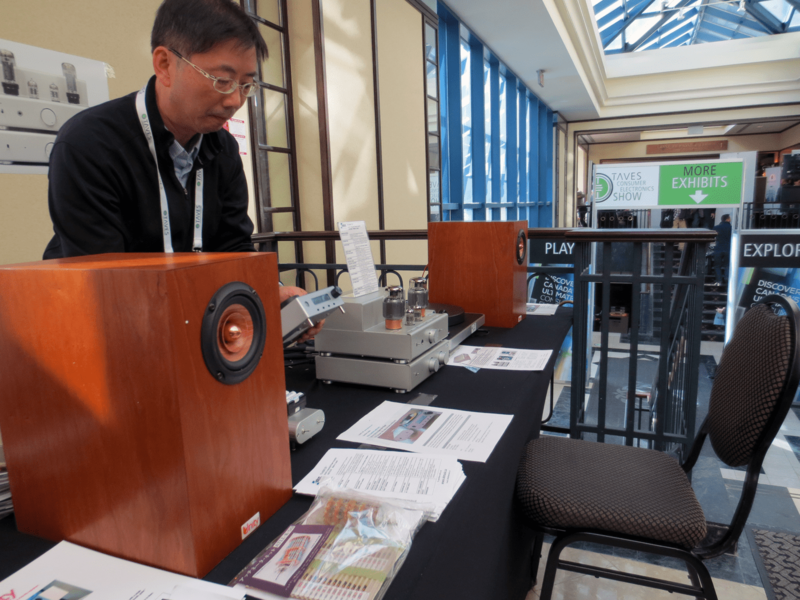 Attendance was reportedly up some 57% from last year, so it seems like things are looking up for TAVES, despite the challenging economic climate for audio in Canada. 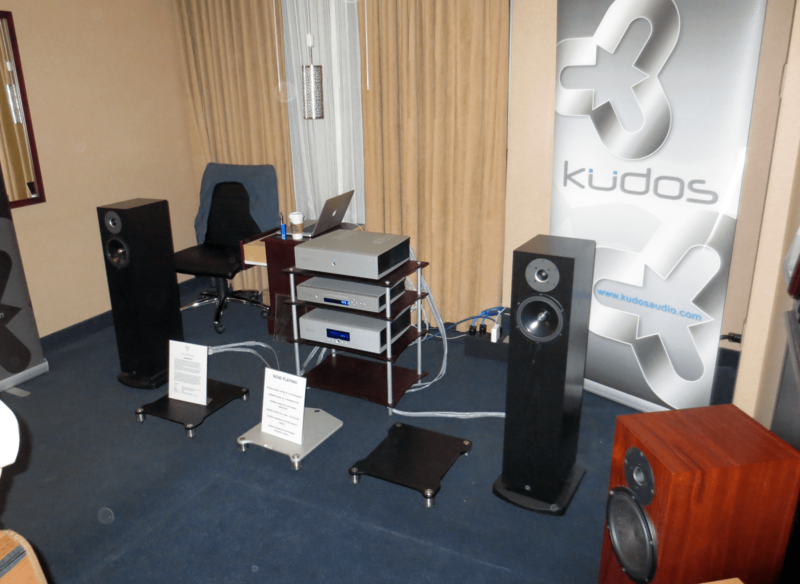 Audio by Mark Jones had an excellent room this year, a big room too. 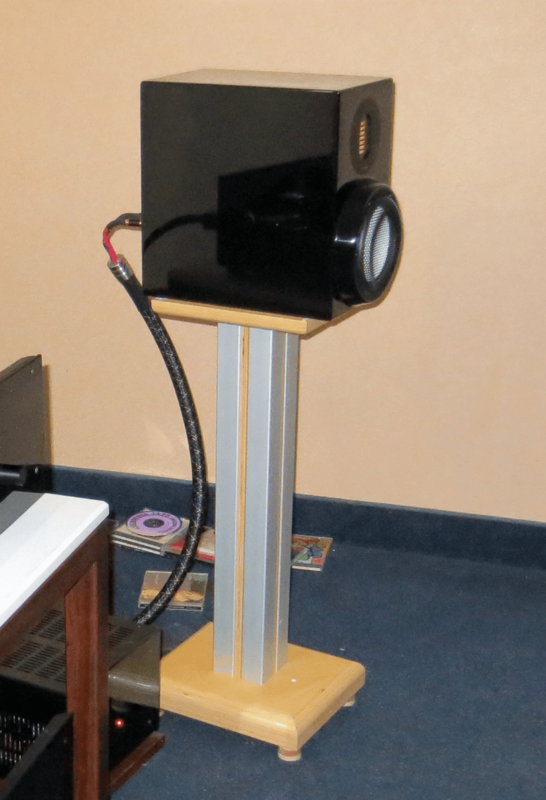 They had to do major modifications to make it sound decent, and make for a worthy introduction for the Magico S7 in its first appearance in front of a Canadian show audience. 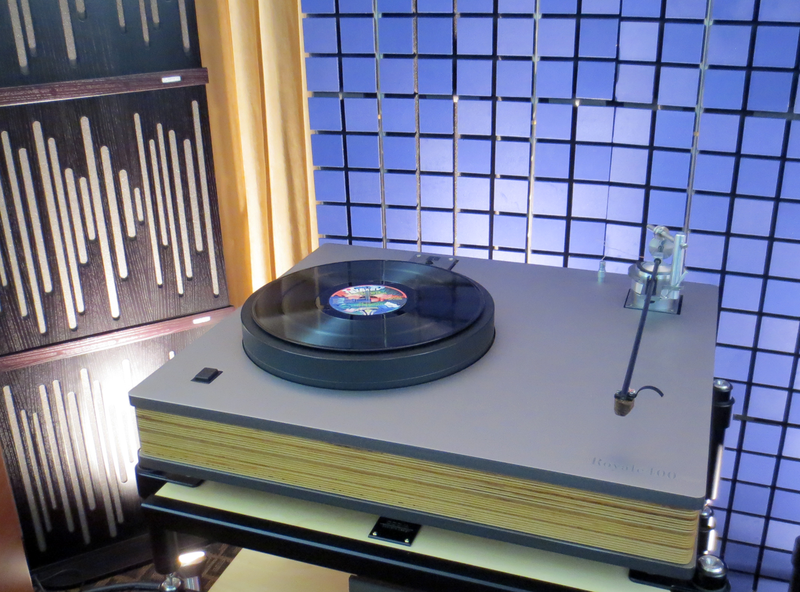 The system was driven by the outstanding Tenor Audio electronics, and featured the big-daddy Kronos Audio turntable. I enjoyed the sounds on tap here: balanced, vivid, and fast. Big. If you have a large space, and a large bank account, this kind of setup would be a lot of fun. Moving to the table displays, and VK Music in particular. It was great to finally meet Victor Kung in person. 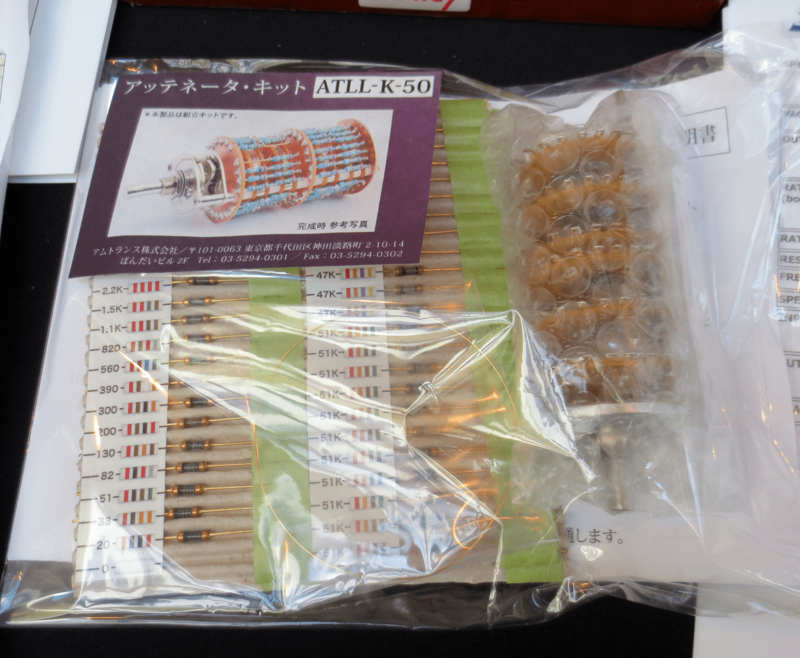 Victor imports and distributes several lines of excellent kits, including the terrific Elekit products from Japan. Not only that, but he’s done all the translation of the kit literature into English (and having just completed an Elekit build, I can attest that they are excellent). Anyone who’s been reading Wall of Sound knows that we’re big Elekit fans here. It was nice to see VK Music teamed up with Ottawa’s Unity Audio – their beautiful Inner Soul speakers, which Tim reviewed earlier this year, were hooked up to one of Victor’s kit systems. 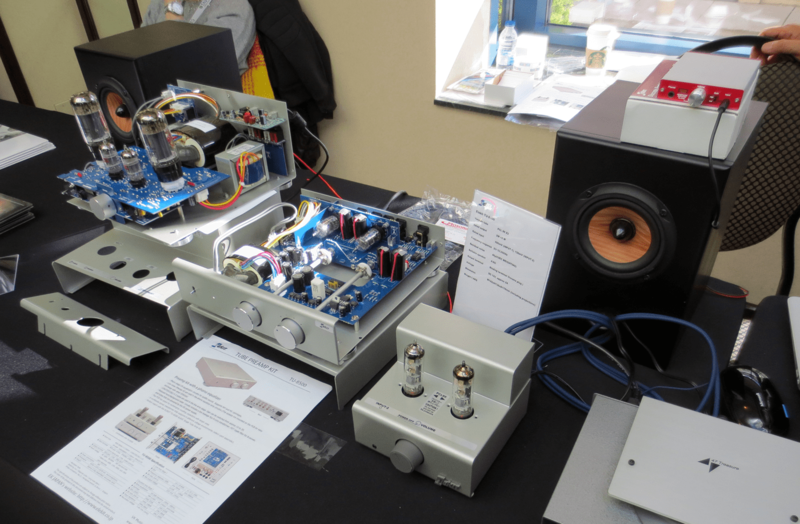 Other table displays I visited included Cambridge’s Mystic Audio, which featured Dynaudio speakers, and Audio Sensibility, with its consistently huge array of cable solutions and used vinyl. These areas were extremely busy the entire day. I did chat with both René and Steve briefly, but even relatively early in the show, I was exhausted just watching these guys work! 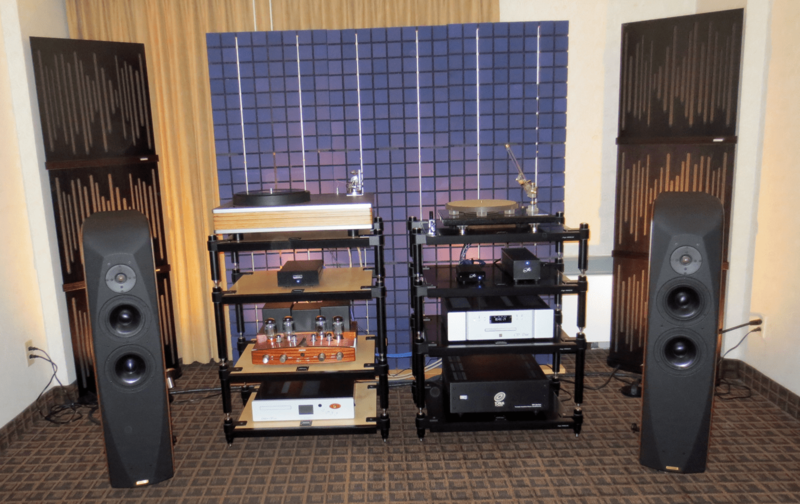 Speaking of static displays – I can’t remember one more impressive than this year’s Zavfino / 1877Phono room. 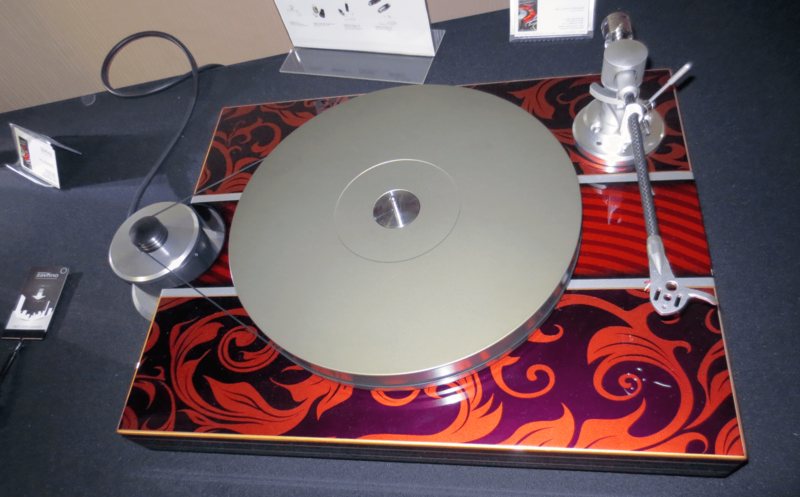 Will Tremblett had close to a dozen of his new turntables at the show, many of them decked out in gorgeous custom paint and pinstriping (each one completely unique). In addition his full line of cable products were on hand. 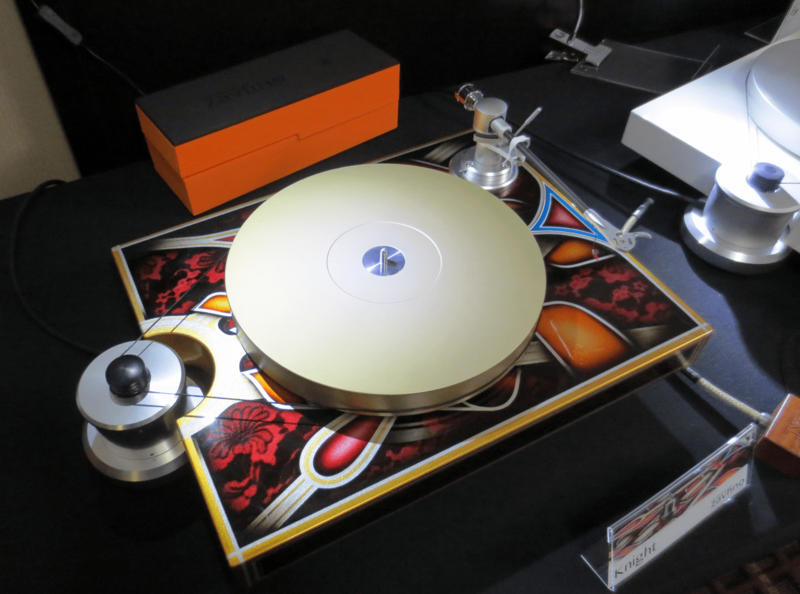 I didn’t get to hear one of the turntables, but Simon Au of AUDIYO has agreed to loan us one for an upcoming review. I can’t wait! 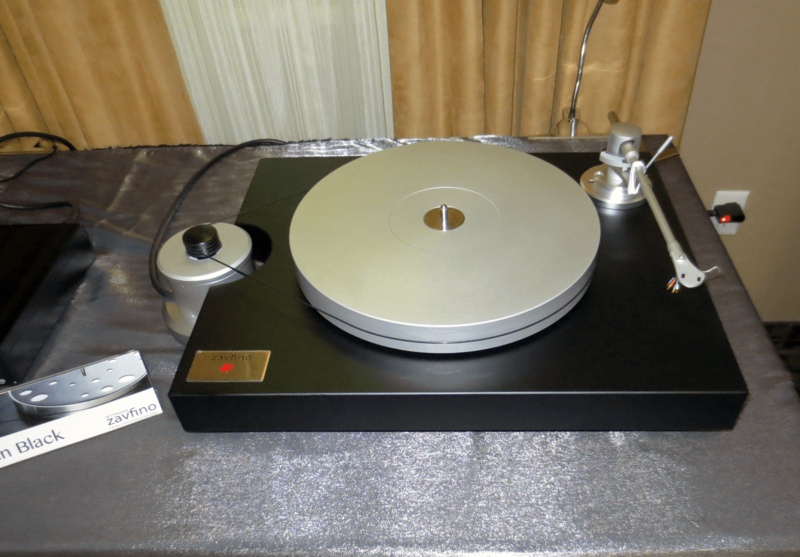 Charisma Audio was well-represented, with a large system again featuring not one but two analog setups – this year, the Pre-audio BT-1301 that I reviewed a few months back, as well as Well-Tempered Labs’ stunning Royale 400, with it’s 16-inch transcription tonearm. 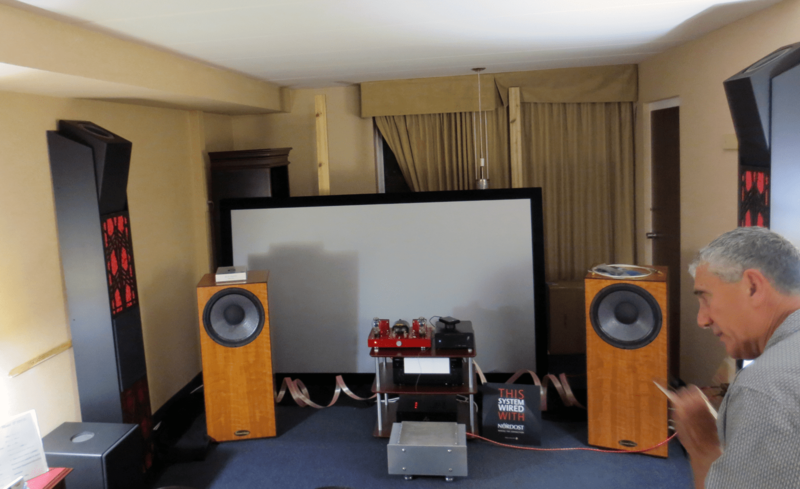 Both sounded outstanding, but the WTL was in a league of its own – it sounded so accurate, it was like listening to vinyl with none of the associated anomalies or shortcomings. 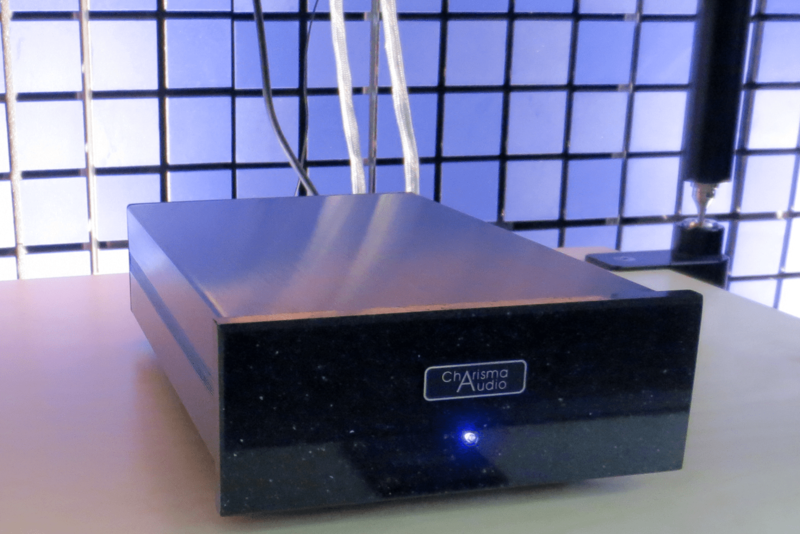 WoS is very much looking forward to reviewing Charisma’s new Musiko phono stage (pictured above) in the near future. Familiar rooms…..all sounding exceptionally good, and noticeably improved over last year (and these were rooms we already loved last year). 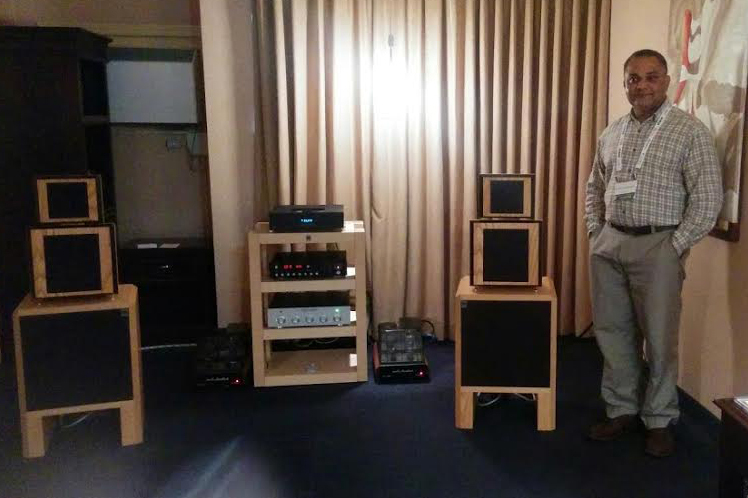 Frank Fazallari’s Coherent Audio was rocking with the big coaxial Model 15’s (Wall of Sound review coming soon) and the infamous “red amp” – Elekit TU-8300 300B SET amp. 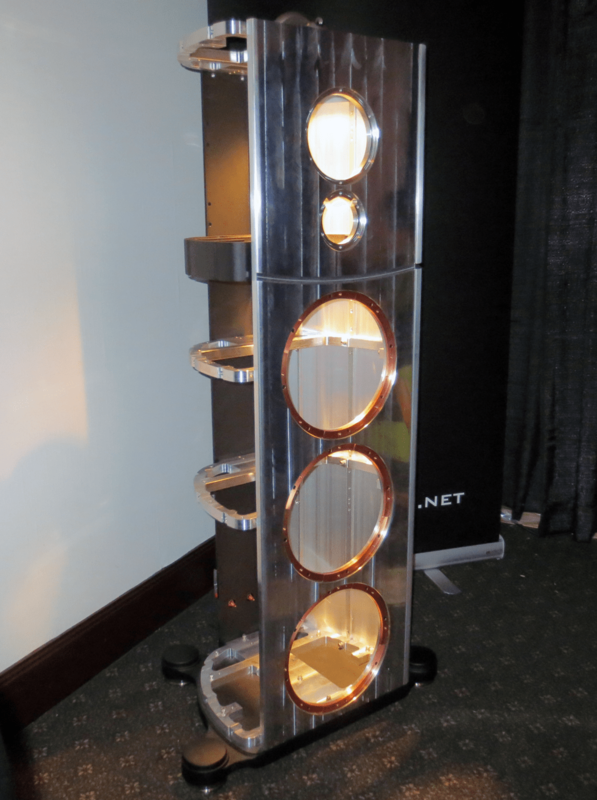 Frank also had four of his stunning new “wall column” speakers set up, these are surround speakers for Dolby Atmos systems. 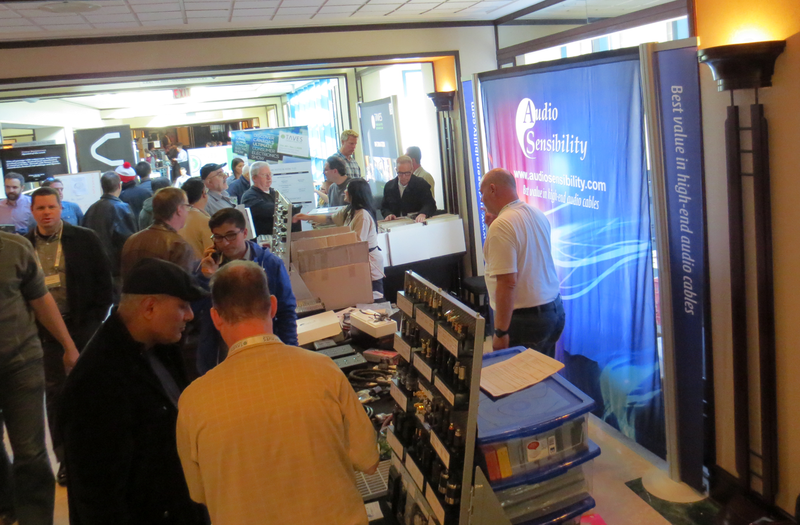 He only had the two-channel rig singing on Friday, but this room was consistently full, and generated a lot of buzz. 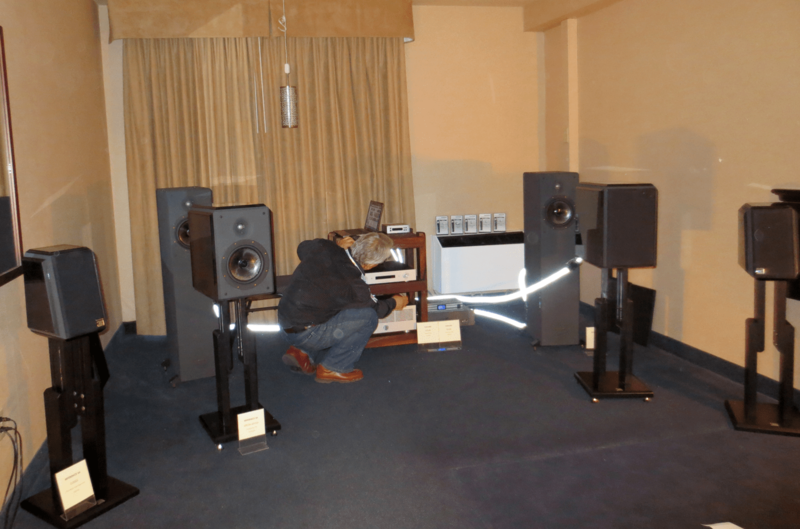 It was great to see Alex Tiefenboeck of Crown Mountain Imports again, this year Alex was showcasing the larger Kudos speakers, and separates from Norma Audio, to excellent effect. 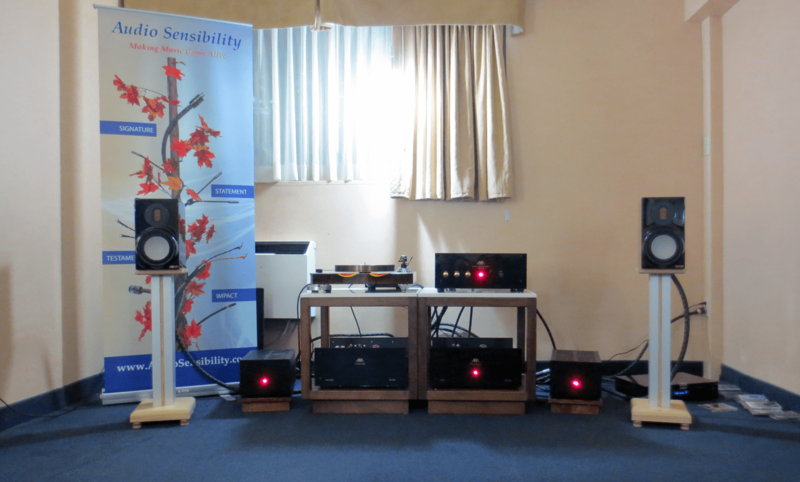 Last but not least, Devine Audio‘s room sounded amazing – the Sound Stage III’s which I recently reviewed, now powered by the Mastersound 300B monoblocks, fed by a Copland preamp and Mark Levinson digital. I noticed that for Coherent and Devine, the buzz continued after the show, on the internet forums. Very happy for both Rohan and Frank, seeing their speakers receiving some well-deserved recognition. 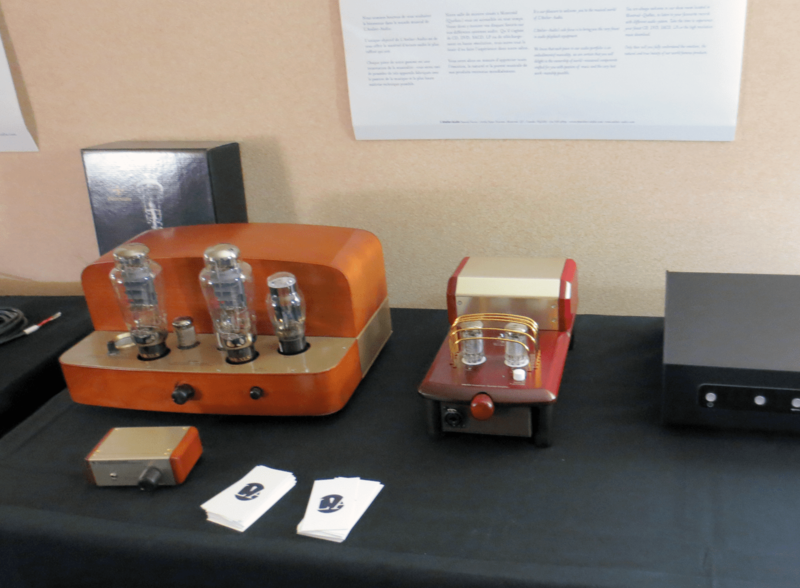 Triode Lab/Finale Audio had an excellent presence this year, not only demoing their superb tube gear, but also showcasing their new joint venture with Robert Gaboury’s Arteluthe. 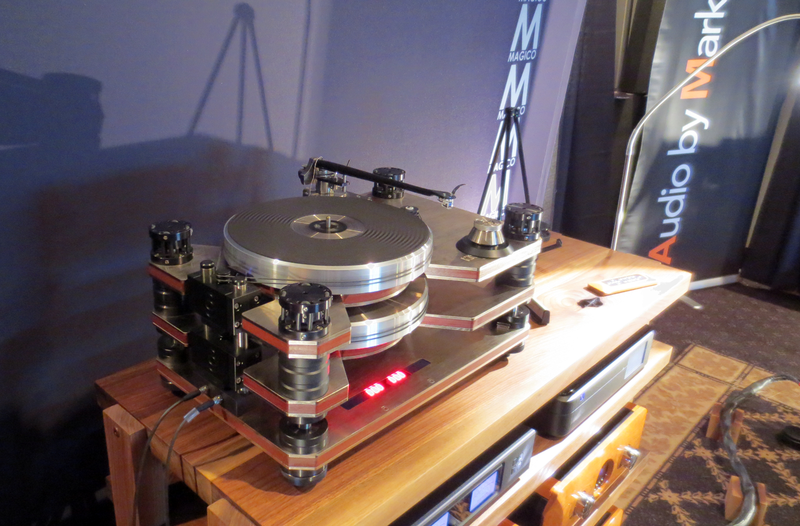 The result of this partnership is the Vivace Mini, which had a lot of people talking. 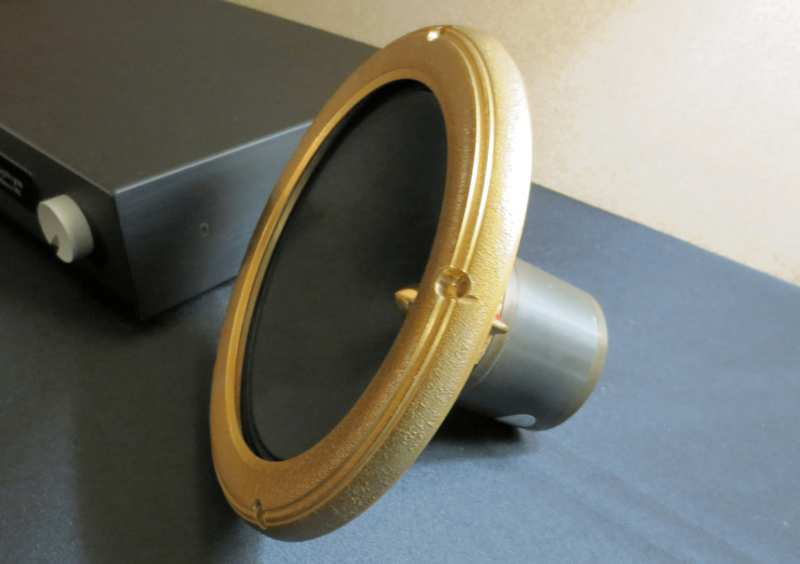 This is a full range, crossoverless speaker based around a 2.75″ driver(!). And it sounded amazing indeed, very natural and lifelike. 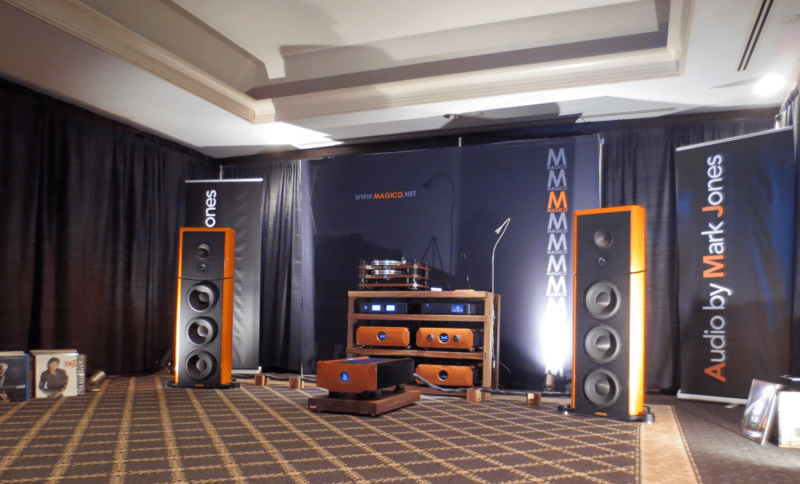 The speaker will retail for $2500, and is currently being reviewed by our man Jon Eben Field, along with the orange 2A3M parallel single-ended monoblocks shown in the photo, and his own copy of the Au Pre Grande preamp. Lastly, the room above: analog spinner by Zavfino, electronics by Audio Note Kits, cabling by Audio Sensibility, and the new MA30 kit speakers from Mundorf (featuring Accuton drivers), distributed by AUDIYO. 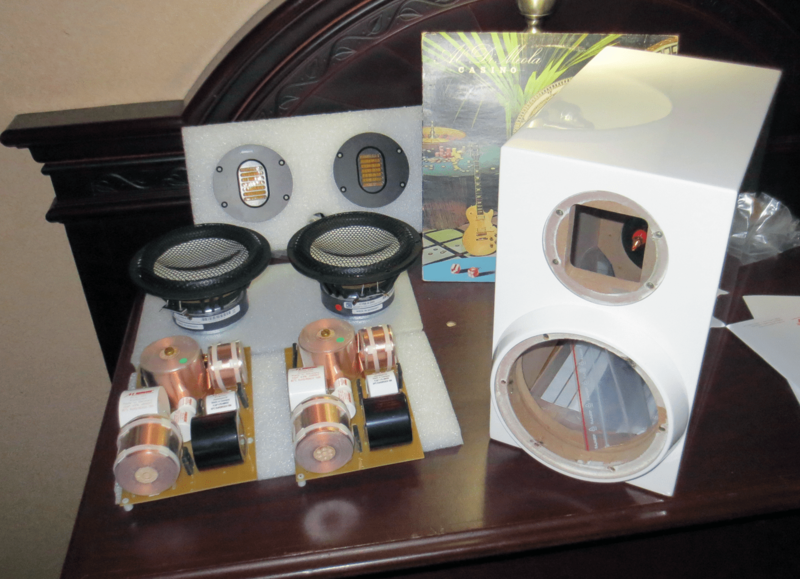 These speakers are sold in kit form, but are largely pre-assembled. So getting them singing is said to be a one-hour job that anyone with a screwdriver can do. They’re made with top-shelf drivers and crossovers, and retail at $3600, in the piano black finish. I thought they sounded very good, especially considering the ‘show conditions’. I’m hoping Wall of Sound will be able to review these speakers soon. 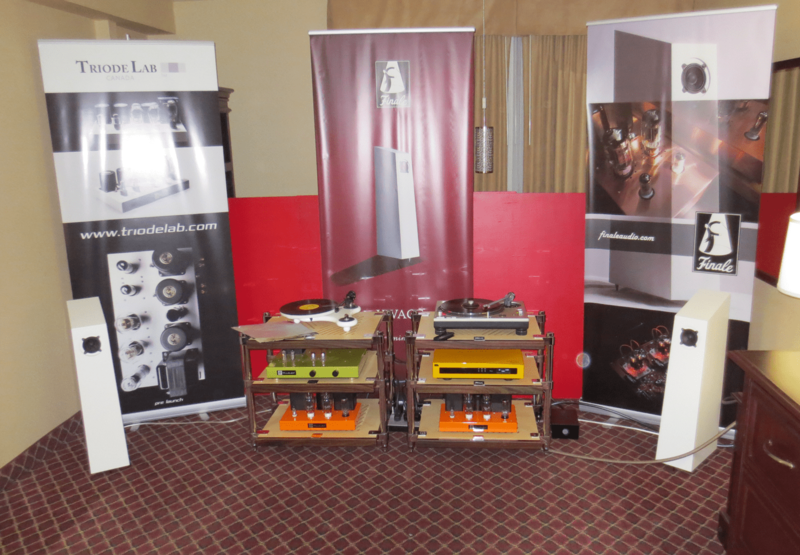 Well, that’s another year of TAVES! It was a pleasure to see everyone, and my hats off to all the dedicated people that make this thing happen each year – well done, guys. You’re the best.